Cooking in Calcutta is about cooking Bengali food. But, it's also about cooking in general, its joys and its challenges, and its universal appeal. I walk to a neighborhood bazaar, full of hope, on a sweltering morning. I reach the store in anticipation of the one thing I have been looking for over the past several weeks: hing bori, sun-dried dumplings, flavored with asafetida. The store owner tells me, after a long pause, that the batch of long-awaited bori has still not arrived. I draw a deep sigh, sweating profusely in the May heat, dabbing my forehead. 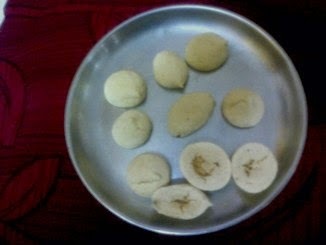 Bori has been of one of my favorite Bengali foods. Even though, bori, also known as bari elsewhere, is eaten all over India, bori has been elevated to an art and has enjoyed a cult status in Bengal. Bori is flavored with different kinds of spices, including asafedita. My craving for hing bori must wait -- until the neighborhood store in Kalikapur gets its supply. That day, after soaking up the sweat oozing on my forehead and swallowing my disappointment at the kirana, or grocery, store, I bought regular bori. Bori is usually used in some special curries, or with vegetables or spinach, or just eaten deep-fried. Someday, perhaps, I will post a recipe. Until then, let bori be a dream gathering on the horizon. I am a marketing communications professional at a global IT company.